Felix Baumgartner broke the speed of sound reaching an estimated speed of 1,357.6 kmh / 843.6 mph / Mach 1.25 jumping from the stratosphere, which when certified will make him the first man to break the speed of sound in freefall while delivering valuable data for future space exploration. Felix climbed to 38,969.4 m / 127,852.4 ft in a helium-filled balloon Sunday morning Oct. 14, 2012. This is exactly 65 years after Chuck Yeager first broke the sound barrier flying in an experimental rocket powered airplane. Felix broke two other world records (highest freefall, highest manned balloon flight), leaving the longest freefall record to project mentor Col. Joe Kittinger. Felix’s entire trip back to earth lasted 9:09 minutes, with 4:22 of that time in freefall (without drogue). Countless millions of people around the world watched his ascent and jump live on television broadcasts and live stream on the Internet. At one point during his freefall Baumgartner appeared to spin rapidly, but he quickly re-gained control and moments later opened his parachute as members of the ground crew cheered and viewers around the world heaved a sigh of relief. Baumgartner and his team spent five years training and preparing for the mission that is designed to improve our scientific understanding of how the body copes with the extreme conditions near space. In preparation for Felix’s first jump from the stratosphere, a long list of procedures came before he ever stepped inside the capsule. His training started years ago practicing high altitude jumps with Luke Aikins, his skydiving consultant, to ensure a solid body position in a relatively stiff pressurized suit. In addition to skydiving Felix has a whole team who supports him from every angle you can imagine, just to get him to the point where his performance in the pressure suit feels like second nature. Two unmanned and two manned test flights had to be completed to the satisfaction of every teammember before the final flight to 128,100 ft could ever move forward. Looking back to the first manned flight and freefall from 71,581 feet, the Red Bull Stratos team was embarking on a mission with many unknowns. The night before March 15, 2012, as would happen for all test flights, the team received final safety and weather briefings. Meteorologist Don Day gave the go-ahead that the dawn ‘weather window’ was suitable for an attempted launch: relatively clear skies and calm winds. During the next eight hours, the capsule was positioned in its cradle on the launch crane, the runway cleared of small debris and the balloon laid out on a vast tarp to protect it from tearing. Shortly before dawn, balloon inflation began. Felix suited up and began pre-breathing oxygen to eliminate nitrogen from his blood before he was sealed inside the pressurized capsule. With balloon inflation complete, the capsule lifted off the tarmac to begin its ascent. Once the ascent was completed, Felix ran through his 39-step safety checklist before manually depressurizing the capsule, sliding open the round door and stepping off the external platform. He continued in freefall until reaching the optimum height to deploy his parachute and float safely back to earth. Upon landing he was met by the retrieval team, medical checks were conducted, and he was returned to the launch site. A television special takes a look inside the vision of an elite team, extreme physical challenges, and what it means to be the only human to experience supersonic freefall – ‘Space Dive’. The BBC together with National Geographic and Red Bull Media House present exclusive, all-access coverage of the Red Bull Stratos project. This feature-length documentary ‘Space Dive’ reveals how Felix Baumgartner and his special team of scientists and engineers broke the world record for a freefall jump. The National Geographic Channel and BBC detailed every moment of the mission with more than 20 cameras. The footage includes exclusive behind-the-scenes access following Felix’s 5 year transition from BASE jumper to near-space explorer. National Geographic Executive Producer Richard Wells offered his perspective on the making of ‘Space Dive’, a co-production between BBC, National Geographic Channel and Red Bull Media House. What was unusual about the way this film was shot and produced? You have roughly 5 years worth of material to work through and edit. How does this film compare to other long term projects? When you first heard of Felix Baumgartner’s attempt, what part of the story fascinated you most / did you most want to tell? The BBC and National Geographic Channel are well-known for their excellent work in documenting innovation and exploration. What aspect of the achievements of the Red Bull Stratos project do you think will come through in your film? Which of the mission team members will the viewer walk away knowing best? Aside from Felix, are there any others who leave the consumer wanting to know more? Time Magazine Person of the Year 2012 – Felix Baumgartner. His nomination shares the ranks with President Barack Obama (Person of the Year 2012), Mars Rover, Former Pres. Bill Clinton and Psy. The very first Time cover in 1927 was dedicated to Charles Lindbergh, who’s solo flight from New York to Paris got the world’s attention. Felix Baumgartner’s jump falls into the category of one of aviation’s greatest accomplishments – breaking the speed of sound without an aircraft on the same day Chuck Yeager busted the sound barrier in the X-1 in 1947. Felix and his team’s efforts are condidered a significant milestone among their aerospace peers, right up there with Col. Joe Kittinger’s record jump in 1960. Preliminary figures from the Fédération Aéronautique Internationale (FAI) indicate Felix broke several records Oct. 14 2012. Chamber tests are conducted at Brooks-City Base in San Antonio, Texas. Capsule is “man-rated” (confirmed appropriate for human transport) to 121,000 feet. After several months’ downtime, mission team reassesses condition of equipment and analyzes test procedures necessary to verify flight readiness. October 14 – Third and final test jump from an estimated 127,852.4 feet (38,969.4 meters) reaching a preliminary speed of 843.6 mph (1,357.6 km/h) (Mach 1.25) jumping from the stratosphere. This makes Felix Baumgartner the first man to break the speed of sound in freefall along with several other records. July 25 – Second test jump from 18 miles / 29 kilometres above the Earth 97,063 feet / 29,584 meters and completed a free fall at a speed of an airliner – 536 miles or 864 kilometres per hour (latest figures sanctioned by USPA and NAA). This jump was a significant achievement in ballooning history but it also proved that safety and recovery systems are functional in preparation for the 120,000 feet attempt. March 15 – First test jump with high altitude balloon and pressurized capsule: Freefall from 71,581 feet over Roswell, NM. Maximum speed: 364.4 mph. Felix is the third person to leap from that altitude and survive. The Red Bull Stratos Mission is backed by the strength and wisdom of the world’s top leaders in aerospace. This team is composed of world-leading experts in medicine, science and engineering, including a former NASA crew surgeon, record-breaking aviators, and designers of some of the most innovative aircraft ever produced. A key member of the team, retired U.S. Air Force Colonel Joe Kittinger is the man who astonished the world with his stratospheric jump more than 50 years ago. WITH A PASSION FOR EXPANDING BOUNDARIES ESPECIALLY IN THE AIR FELIX BAUMGARTNER IS AN EXPERT PARACHUTIST. Best known for completing an unprecedented freefall flight across the English Channel using a carbon wing. Felix, born April 20, 1969, grew up in Salzburg, Austria where he dreamed of skydiving and flying helicopters and was inspired by astronauts on TV. He made his first skydive at age 16. After sharpening his parachute skills as a member of a Special Forces demonstration team for the Austrian military, he supported himself by repairing motorcycles before becoming a skydiving professional. Eager to test the limits, Felix set a record for history’s lowest BASE jump (from Rio de Janeiro’s Christ the Redeemer statue), twice set world records for the highest BASE jump from a building (Petronas Towers in Kuala Lumpur and Taipei 101 tower), and even landed his canopy inside a cave in Croatia. IS ENSHRINED IN THE NATIONAL AVIATION HALL OF FAME, CREDITED FOR HELPING NASA’S ASTRONAUT PROGRAM. It was the “highest step in the world”. Joe Kittinger made history as he ascended to 102,800 feet in a high-altitude balloon and jumped to Earth, setting four world records. During a distinguished USAF career, Joe served as a test pilot, Squadron Commander, and Vice Wing Commander, and he spent 11 months as a POW in Vietnam. He retired as a Colonel and subsequently set two world ballooning records and won numerous ballooning competitions. Joe is a National Aeronautics Association Elder Statesman of Aviation; was awarded a Lifetime Achievement in Aviation trophy from the Smithsonian National Air and Space Museum; was made an Honorary U.S. Army Golden Knight; and is enshrined in the National Aviation Hall of Fame, the U.S. Ballooning Hall of Fame and the National Skydiving Museum Hall of Fame. To date, Joe has logged more than 16,800 hours of flying time in over 93 aircraft. His adventures are detailed in his autobiography, Come Up and Get Me. He shares his knowledge to help address the challenges of Red Bull Stratos, and as “Capcom” (capsule communications) he will be Mission Control’s primary point of radio contact with Felix Baumgartner during ascent. WAS FELIX BAUMGARTNER’S EARLIEST COLLABORATOR IN ENVISIONING RED BULL STRATOS. As technical project director for Red Bull Stratos, Art Thompson conceptualized and drove the design, engineering and fabrication of the flight vehicle including development of the life support systems, flight equipment and flight-testing program. He was responsible for program management and handling of the mission’s critical technology as well as assembly and oversight of the entire Stratos project team. Art possesses more than three decades of experience in innovating leading-edge design that has produced major milestones in aerospace history, including development of the B-2 “Stealth” aircraft. A California native, he studied engineering at the University of California, Los Angeles, and attended the University of La Verne and Northrop University. It was while working for Northrop Corporation that he served on a team brainstorming ideas for an aircraft that could avoid radar detection; their design would become the B-2 Spirit. Art co-founded his own company, Sage Cheshire Aerospace, Inc., to provide a wide range of aerospace needs, from initial design and engineering to finished product, while a sister business, A2ZFX Inc., extends the benefit of Art’s creative thinking to other fields – producing tools, molds, digital products, and more for clients from aerospace manufacturers to movie producers for films like “Batman & Robin”, “Contact”, “Total Recall”, “Air Force One” and “Blade”. Art is a member of the Aerospace Medical Association (AsMA), American Institute of Aeronautics and Astronautics (AIAA), National Aeronautical Association (NAA), Society of Experimental Test Pilots (SETP, corporate member), and the Air Force Flight Test Historical Foundation at Edwards AFB Board of Directors; He is International Association for the Advancement of Space Safety (IAASS) Space Safety 2013 Jerome Lederer Pioneer Award recipient; 2012 Collier Trophy nominee; 2012 Laureate Award nominee; 2013 Excellence in Aviation Award recipient from the Flight Test Historical Foundation; Hall of Fame 2013 Inductee, San Diego Air and Space Museum; Honorary U.S. Army Golden Knight; recognized by the New Mexico and California Senates for contributions in aerospace and human physiology for egress from high altitude. IS FELIX BAUMGARTNER’S LIFE PRESERVER – ENSURING PROPER FITTING EQUIPMENT AND A SAFE RETURN HOME FROM THE STRATOSPHERE. As the Red Bull Stratos life support engineer, Mike Todd is responsible for the equipment that will keep Felix Baumgartner alive as he freefalls through near space: his pressure suit and helmet and their oxygen components. Mike not only helped to suggest and perfect the design innovations of this vital life-support gear; he personally maintains the suit, coordinating with Red Bull Stratos team members to ensure that everything – from capsule layout to parachute deployment – works harmoniously with its design. Mike always assists Felix in suiting up, and he’ll likely be the last person Felix sees before the capsule is sealed. An expert skydiver, parachute rigger and pilot, Mike was an associate engineer, designer and test jumper for parachute manufacturer Pioneer, then worked in the High Altitude Life Support and Pressure Suit Division of Lockheed’s “Skunk Works” for almost 30 years, finding solutions for some of the most exciting challenges in aerospace. He also fitted pressure suits for Steve Fossett’s record-setting Perlan glider project. WILL SUPPORT FELIX ON HIS JOURNEY TO ACHIEVE PEAK PERFORMANCE – AN UNDERSTATED NECESSITY FOR A MISSION LIKE RED BULL STRATOS. Dr. Andy Walshe came to Red Bull Stratos as director of high performance for Red Bull’s global athlete development program, where he works with hundreds of international athletes; supervises a team of industry-leading sports scientists, nutritionists, biomechanics experts and sports psychologists; and develops elite sports performance models. 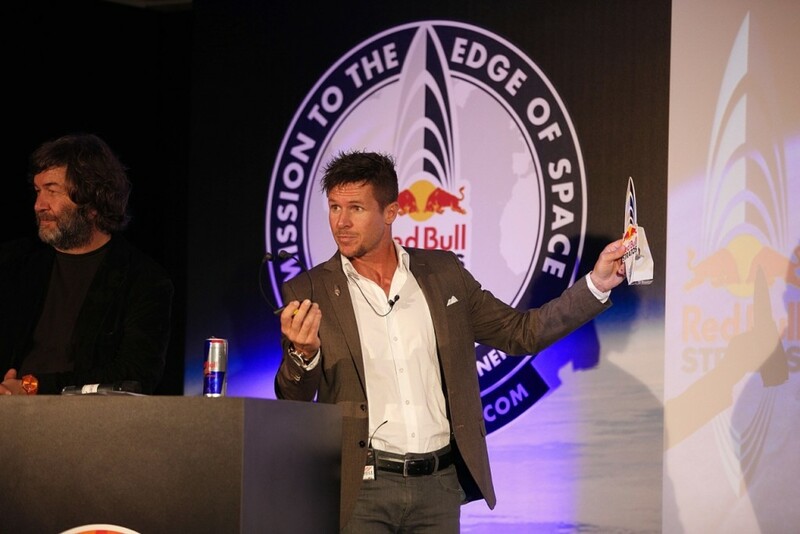 As performance manager for Red Bull Stratos, Andy and his team help Felix Baumgartner execute a performance plan by encompassing both physical and psychological readiness, and provide high performance direction and support for the entire mission team. Andy’s professional interests are focused on delivering pragmatic solutions to explore all kinds of human potential; he is a consultant for business, sports and military organizations worldwide. With a Ph.D. in Applied Biomechanics (the science of movement) and applied coaching expertise in performance training, the Australian native designed a highly successful performance program for the U.S. Olympic ski and snowboard teams, guiding their athletes to victories on the world stage. MEETS CHALLENGING SKYDIVING MISSIONS WITH SPECIALIZED HANDS-ON TECHNIQUES. 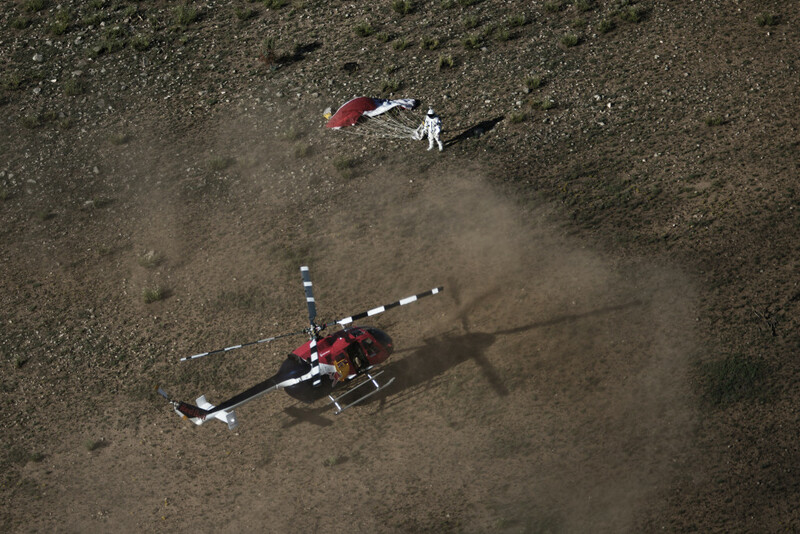 HIS AERIAL TESTING REDEFINES FREEFALL PROCEDURES FOR THE RED BULL STRATOS MISSION. A professional skydiver with two decades of experience and more than 16,000 jumps to his credit, Luke Aikins has a lifelong history of tackling aviation challenges that are out of the ordinary. He’s one of the few people with the background and body awareness to envision, fabricate and safely resolve the most precarious situations that Felix Baumgartner could encounter on his descent. Whether he’s suggesting a new parachute configuration, innovating drogue deployment or determining optimal flight postures, Luke is the test subject for the mission team, willingly throwing himself into worst-case scenarios. He also works one-on-one with Felix during intensive airborne training sessions. Born to a skydiving dynasty, Luke is on staff at Washington’s Kapowsin Air Sports, and he has contributed to the family legacy with three world records. He’s an expert at the precision skydiving discipline of swooping; he’s one of the pioneers of combining a canopy with skis to fly vertically down mountain sides; and he’s an adept BASE jumper and airplane pilot. All of that experience comes into play in Luke’s role as a member of the Red Bull Air Force, an elite team of skydivers, BASE jumpers and paraglider pilots who explore and advocate the possibilities of human flight. Luke shares his knowledge as an instructor and coach, working with jumpers ranging from U.S. Navy Seals to NASCAR driver Brian Vickers. Further, he is one of the designated Safety and Training Advisors for the United States Parachute Association – collaborating with manufacturers, USPA officials, and the world’s top parachute pilots to develop and advocate training techniques, procedures and regulations intended to advance skydiving safety. Luke is also an expert aerial photographer, with work published in newspapers and magazines worldwide. Luke’s advice has resulted in revisions to the chest pack and parachute setups for the Red Bull Stratos mission, and he has played a leading role in designing the drogue chute’s attachment and deployment. Luke’s efforts behind the scenes give Felix time to focus on preparations such as pressure-suit fittings and training with capsule instrumentation. In evaluating aspects such as how the position of an oxygen canister or camera will affect Felix’s center of gravity, and in skydiving with Felix to assess his technique, Luke has conducted test jumps from as high as 28,000 feet. He is an essential member of the team devising the progression of jumps that Felix will complete as he trains toward the target altitude of 120,000 feet. MULTILEVEL TESTING PROVES OUT SAFETY SYSTEMS FOR THE TEAM AND FELIX BAUMGARTNER. Joe Kittinger knows high-altitude balloon launches, having witnessed more than 100 balloon flights, five of which were his own. The safety behind the Red Bull Stratos Mission is ensured through multi-stage testing. The first unmanned flight was conducted December 2011, and the second test followed in January 2012. The idea behind an unmanned flight test is to check every piece of engineering without Felix in the capsule. The goals accomplished included varifying the parachute systems, monitoring the drop pod representing Felix in size and weight, and confirming the electroncs and camera systems from launch to landing. All of the important data Felix wears during the manned tests, satellite tracking and electronics, was stored inside the drop pod. After the capsule and pod landed under parachute in New Mexico, the team used the data to determine Felix’s potential freefall speed at various altitudes, detect any spinning tendencies, and confirm GPS tracking. The following list is a brief sample of the components checked during the unmanned tests. T-slim unit to transmit GPS signal from the Pod (chest pack). 3 Cameras on pod and 3 cameras on the capsule. RF signal testing for data downlink cross verified with the ATA system. The morning of March 15, 2012 Felix Baumgartner landed with his parachute in the New Mexico desert nearly 30 miles away from Roswell, wearing a spacesuit as he safely completed a journey towards the edge of space. Just 1 hour and 40 minutes earlier Felix lifted off from Roswell on board a space capsule attached to a 165-foot-high helium balloon that brought him to an altitude of 21,818 meters (71,581 feet). This effort takes more than 100 expert personnel who have been building and creating one-of-a-kind technology, and sometimes coming together from across the world. Data from the International Air Sports Federation (FAI) shows how the 1st manned test measured up. At the time this was considered the maximum vertical speed world record. Felix would later break his own record two more times. The goal of this expedition towards the edge of space was to fly over the “Armstrong Line” and to do tests under real conditions for the first time. That is the area in aerospace where earthly boundaries and laws disappear. It’s an inhospitable region for humans where liquids begin to vaporize and temperatures plunge to minus 75 degrees Fahrenheit. Humans could not survive in this zone without a pressurized suit to protect against the forces of depressurization and lack of oxygen. To get there, Felix first had to make it through another “death zone” closer to earth. During the first 1,000 feet of his ascent there would be no time to escape the capsule and open the parachute in the event of a malfunction. During this first manned test the flight to the stratosphere and exit from the capsule went exactly as planned. Felix plunged back towards earth at a speed of nearly 365 miles per hour. He said later the most difficult part was the extreme cold he encountered. “I could hardly move my hands. We’re going to have to do some work on that aspect,” he said. The Austrian added that he also needs to work on getting accustomed to the extraordinary dimensions of space. “I wanted to open the parachute after descending for a while, but I noticed that I was still at an altitude of 50,000 feet,” he said. Even though it was only a test jump for his forthcoming leap from an altitude of nearly 23 miles, Baumgartner still managed to make it into the record books. He became only the third person to leap from that altitude and survive. The only people to successfully jump from greater heights were Russia’s Eugene Andreev and American Joseph Kittinger, both of whom accomplished their feats in the 1960s. Kittinger, a living legend now 83 years old, is serving as a mentor for the Red Bull Stratos project and was heading Baumgartner’s test flight from Mission Control in Roswell. Kittinger is on the team of nearly 100 top experts recruited from the fields of science, medicine and aerospace for the mission. The test demonstrated that not only did the capsule system function exactly as planned, but the giant stratospheric balloon did as well, as balloon launch director Ed Coca confirmed. The delicate giant, which was inflated with helium in the early morning hours, was remotely deflated after Baumgartner’s descent, exactly as planned. The space capsule, Felix’s vehicle for the jump, was detached from the balloon with an explosive device, descended under a parachute and later landed undamaged in the desert. “This test serves as the perfect motivation for the team for the next step,” said Felix, flashing a wide smile after two previous attempts to launch earlier that week had to be scrubbed. With the success of his second stratospheric test jump, Felix Baumgartner completed the final milestone before attempting to fulfill his dream of becoming the first person to break the speed of sound in freefall. Significance of test: A jump from at least 90,000 feet / 27,432 meters has always been part of the Red Bull Stratos test plan, but the significance became even greater after the mission’s test phase in March – which, while successful, encountered aberrations including an aborted launch due to balloon failure, lapses in radio transmission and thermal challenges in temperatures approaching -90 degrees Fahrenheit / -70 degrees Celsius. The latest successful test at an even higher altitude confirms that these issues have been resolved for Baumgartner’s safety while also providing new data for the benefit of aerospace research. Pending official data review and confirmation, the leap from 97,145.7 feet / 29,610 meters takes Baumgartner past Russia’s Yevgeny Andreyev (83,523 feet / 25,458 meters) to make him only the second man to have successfully completed a jump from such an altitude. His planned freefall from 120,000 feet / 36,576 meters would finally break the record of 102,800 feet / 31,333 meters set 52 years ago by the only man who has jumped from a higher altitude, Baumgartner’s mentor Joe Kittinger. RED BULL STRATOS SEEKS TO ADVANCE SCIENTIFIC DISCOVERIES IN AEROSPACE FOR THE BENEFIT OF MANKIND. The purpose of the Red Bull Stratos mission is to transcend human limits. Supported by a team of experts Felix Baumgartner ascended to 128,100 feet in a stratospheric balloon and made a freefall jump rushing toward earth at supersonic speeds before parachuting to the ground. His successful feat on Oct. 14, 2012 holds the potential to provide valuable medical and scientific research data for future pioneers. The Red Bull Stratos team brings together the world’s leading minds in aerospace medicine, engineering, pressure suit development, capsule creation and balloon fabrication. Retired United States Air Force Colonel Joseph Kittinger, previously held the record jump from 102,800 ft in 1960. This was during a time when no one knew if a human could survive a jump from the edge of space. Joe was a Captain in the U.S. Air Force and had already taken a balloon to 97,000 feet in Project ManHigh and survived a drogue mishap during a jump from 76,400 feet in Excelsior I. The Excelsior III mission was his 33rd parachute jump. Although researching extremes was part of the program’s goals, setting records wasn’t the mission’s purpose. Joe ascended in helium balloon launched from the back of a truck. He wore a pressurized suit on the way up in an open, unpressurized gondola. Scientific data captured from Joe’s jump was shared with U.S. research personnel for development of the space program. Today Felix and his specialized team want to take what was learned from Joe’s jumps more than 50 years ago, and combine that with data aquired during Felix’s supersonic freefall. NEW MEXICO PROVED TO BE THE BEST PLATFORM FOR THE RED BULL STRATOS MISSION WITH ITS MILD WEATHER. New Mexico offers a wide range of relatively low populated ranch land, access to excellent launch facilities. Roswell’s reputation for mostly sunny weather makes it the ideal site for balloon launches. Felix Baumgartner’s capsule launched under a high-altitude helium balloon from this desert region of the southwestern United States supported by a Mission Control Center on site. The city of Roswell covers approximately 29 miles of the Pecos River valley, with the Sacramento Mountains to its west. In general the Roswell area is flat and semi-arid, with a sparse population outside the city and typically excellent sightlines. Average temperatures range from about 40° F. (Jan.) to about 83° F. (July). Rainfall averages just 10.75 inches per year. Native Americans have been living in the New Mexico region for some 20,000 years, and white settlers began to establish Roswell in the latter half of the 19th century. In the 20th century, New Mexico became a hub for aerospace innovation, including, among many other groundbreaking initiatives, Dr. Robert H. Goddard’s Roswell-based research on rocket propulsion, which marked the beginning of the Space Age; Dr. John Paul Stapp’s rocket-sled tests proving that high-speed ejection was survivable; and the record-setting balloon jump of Joe Kittinger that paved the way for space programs. Today, both government and commercial enterprises continue to contribute to the state’s rich aerospace legacy. The world governing body for aeronautic records, the Fédération Aéronautique Internationale (FAI), has confirmed that their stringent verification process is complete and Felix Baumgartner did, as anticipated, break world records in three official categories. Baumgartner and the Red Bull Stratos program also set numerous records that do not fall within the official categories outlined in the FAI rules. Most significant among them: Baumgartner was first person to break the speed of sound without the protection or propulsion of a vehicle. Proof that a human can safely break the speed of sound in freefall opens up new avenues in the search for ways to escape from high-altitude aircraft in emergency situations. The official world governing body for certification of aeronautic records is the Fédération Aéronautique Internationale (FAI). All claims for records must be monitored and verified under controlled conditions, meticulously documented and submitted according to the Federation’s stringent standards. Here’s a rundown of how the records claimed in Felix Baumgartner’s test jumps and final jump are submitted for confirmation as World Records. The jump must be conducted in the presence of one or more Official Observers from one of the FAI’s designated National Airsport Control (NAC) organizations. Because the Red Bull Stratos launches are conducted in the U.S., the controlling NAC is the National Aeronautic Association of the United States (NAA). Shortly before Felix suits up, a blank microSD (secure digital) data card is inserted into the high performance GPS data logger in his chest pack. A visible seal is applied and the chest pack cover is replaced with screws. An Official Observer from the NAA remains at the launch site until Felix is inside the capsule and launch is complete. After the launch, the Official Observer flies in the retrieval helicopter to the landing site. On landing, if all is well, the Official Observer takes possession of the chest pack and maintains possession until the seal has been checked and the data card removed. An initial analysis is made of the data in order to determine if a claim can be made and to formulate a tentative assessment of the performance. Within seven days of a record attempt, the FAI must be officially notified that the jump was successful and provided with basic details of the performance. Next, a report containing complete details of the attempt must be prepared and submitted to an NAC organization, including any evidence required (such as GPS data). This report may include adjustments to the figures submitted in the original FAI notification as warranted by data analysis. In the case of Red Bull Stratos, in which an Austrian native is jumping, the NAC receiving the report is the Aeroclub of Austria. Once the information is certified as a national record, and within 120 days of the record event, the NAC must submit a complete dossier containing the original evidence to the Fédération Aéronautique Internationale headquarters in Lausanne, Switzerland, requesting that the FAI approve the record as a World Record. A final review will be completed by the FAI. Once the FAI is satisfied that all of the substantiating requirements have been met, the World Record will be published and entered into the record books. Brian explains, “It was clear from the beginning that GPS was the only practical technology that would provide the necessary data record in the environment of the jumps. But there were a number of challenges.” Among them was the fact that the stratospheric environment – and Felix’s goal of supersonic speed — were beyond any previous use of GPS for FAI certification. Further, because of U.S. Department of Defense restrictions for security purposes, most GPS devices don’t support measurement of altitudes above 60,000 feet. Once the team selected a GPS system, scrupulous testing was carried out to verify its accuracy. Evaluations included twice dropping an unmanned test pod to simulate manned flight from stratospheric altitudes and comparing the results to those of a Doppler radar. Brian uses this verified system to retrieve Felix’s jump data and, employing software programs that he has created, produces the analysis and reports that are submitted to the NAC and, ultimately, the FAI for “homologation” (certification).In March 2012, for example, Felix’s test jump set a new record for Vertical Speed (pending confirmation). Preparation of the nine-page report required a month of work, in part to resolve errant GPS data created when Felix was briefly inverted. The overall process can’t be rushed, because the integrity of the data and process is paramount; but when a record IS confirmed, the result is well worth the wait. As the official observer for the Contest and Records Board of the National Aeronautic Association (NAA), Brian Utley is responsible for certifying that all requirements for a World Record have been satisfied, including analyzing and verifying the data captured during Felix Baumgartner’s jump from the edge of space and submitting it for confirmation by the Fédération Aéronautique Internationale (FAI), the governing organization for aeronautic records worldwide. A native of the United Kingdom who moved to the United States as a teenager, Brian has lived on a variety of continents during decades of work in aviation and with IBM. One of his particular areas of expertise is evaluating and documenting methods of measuring aeronautic performance, and he has been instrumental in developing the application of a secure, high-speed GPS flight recording system to accurately confirm world records, resulting in an improved recording process. He has been a member of the Contest and Records Board (an independent authority in the administration, documentation and certification of all record attempts sanctioned by the NAA) since 2003. An avid glider pilot, Brian has served as president of the Soaring Society of America and the Soaring Foundation, and he personally established numerous soaring records in his state of residence, Minnesota – including several that have stood for more than 30 years. In 2011, Brian was inducted into the Minnesota Aviation Hall of Fame and was also awarded the FAI’s Tissandier Diploma for his service to aviation. What does it mean to “break the speed of sound”? Breaking the speed of sound refers to catching up with – and surpassing – the speed at which sound waves are produced in the air. The speed of sound is affected by temperature: where the air is colder, sound travels more slowly. At about 100,000 feet above sea level, Felix Baumgartner would have to go 690 miles per hour to match the speed of sound, known as Mach 1. Then if he continues to accelerate and surpasses the speed of sound, he’ll be “supersonic.” On Oct. 14 Felix reached an estimated speed of 833.9 mph, surpassing the speed of sound. Is there really a sound “barrier”? No, it’s a figure of speech. The concept stems from the mid-20th century, when early high-speed aircraft sometimes experienced extreme instability, and even broke up, as they neared the speed of sound. Today we know that such instability is caused by shock waves that build up in the “transonic” zone – the range of speeds approaching the speed of sound. Sometimes shock waves even collide with each other, a phenomenon known as the “shock-shock interaction,” creating results that can be similar to an explosion. Fortunately, the impact of shock waves becomes less severe with higher altitude, because air becomes less dense. And once an object passes through that imaginary “sound barrier” to catch up with and surpass the speed of sound, flight is smooth. The list includes temperatures well below freezing, too little oxygen to breathe, the tendency to spin uncontrollably and air pressure so low that without protection blood is said to “boil” with vapor bubbles. Strategies include intensive training to prepare him for possible instability: the team has developed a graduated, multi-stage test program in which he jumps from successively higher outdoor altitudes, as well as a choreographed step-offfrom the capsule so that he achieves a streamlined position. Equipment is also important: an innovative full-pressure suit and helmet provide oxygen, protection and pressurization, and a special drogue parachute is available for stabilization if necessary. Why won’t Felix reach terminal velocity before he breaks the speed of sound? Terminal velocity, a concept familiar to skydivers, refers to the point at which a falling object stops accelerating. Drag, or resistance, is one of the key factors causing terminal velocity. Bailing out at a very high altitude, where the air is thin, should enable Felix to break the speed of sound before reaching more dense air that will create drag and eventually result in his terminal velocity. Still, he’ll want to streamline his body as quickly as possible to aid his acceleration. Equipment in Felix’s chest pack will capture and record the necessary data for review by the mission team as well as by the Fédération Aéronautique Internationale world governing body. THIS IS A HOSTILE PLACE FOR HUMANS – BOTH TEMPERATURE AND A LACK OF PRESSURE POSE THE BIGGEST THREAT. THE EARTH’S ATMOSPHERE IS DIVIDED INTO 5 LAYERS. WE LIVE IN THE TROPOSHERE. FELIX JUMPED FROM THE STRATOSPHERE. Air pressure is nearly nonexistent at Felix’s jump altitude of 128,100 feet – this means 99% of the earth’s atmosphere was out of reach. Normally the atmosphere cools a few degrees with a rise in altitude. Flying a jet at about 35,000 ft is typically where temperatures drop off dramatically to -50F or even -70F degrees. The cooling trend slows down as you enter the initial layer of the stratosphere, which is never at an exact altitude. The stratosphere just like any layer of the atmosphere starts and stops at various heights depending on where you are on the planet. These layers are temperature dependent. So Bobby McGee at the equator will give a report on the altitude of the stratosphere which will differ from Jenny McGoo’s report because she lives at the North Pole. These variations change with the seasons too. So the reason the temperature actually increases as you climb through the stratosphere is due to the ozone layer. Ozone molecules absorb energy and give heat back to the stratosphere. Still, it’s very cold: 0 to -10F degrees. WEATHER IS A POWERFUL FORCE IN THE SUCCESS OF EACH JUMP. One of the primary factors affecting the success of the Red Bull Stratos mission is the weather. It’s also one of the most unpredictable. The wind must be calm. Susceptibility to wind variation increases with balloon size and the Red Bull Stratos balloon is massive. Further, the balloon is only .0008 inches thick (10 times thinner than a sandwich bag). Even before takeoff, the 55-story-high envelope could tear if caught by a wind gust or overturn the mega-ton crane that positions the capsule for launch. Take-off will not be authorized if winds exceed 2 miles per hour from ground level through to several hundred feet in altitude. The team will assess winds throughout the mission – especially at the border of the stratosphere, where turbulence is common. Also, because the balloon will be steered using wind currents, determining wind patterns aloft will enable the team to predict the landing zone even before launch. Precipitation – whether in the form of snow, ice, rain or heavy fog – could impair visibility for the team and the performance of the balloon. Precipitation of any kind, or even excess humidity, will prevent a launch. Excessive frost or ice build-up on the balloon could impede takeoff or ascent by adding potentially hundreds of pounds to the weight of the payload. To comply with U.S. Federal Aviation Administration regulations, the Red Bull Stratos balloon will not fly if skies are more than 5/10 (half) overcast or if the horizontal visibility at any point is less than 3 miles. Clear skies will enable better tracking of the capsule’s ascent and Felix Baumgartner’s descent, and will provide Felix with the best possible conditions for orienting himself in the sky. Another kind of phenomenon that will be tracked is solar flares, bursts of explosive activity on the sun. Such activity can create “solar storms” that affect satellite and radio communication. Fortunately forecasters can see solar storms coming because it takes many hours – usually days – for the effects to reach Earth’s atmosphere. The mission team will plan the launch to avoid solar flares. Because all these factors directly impact the ability to launch, Red Bull Stratos meteorologist Don Day minutely examines both historical and current weather profiles. Using computer weather models to predict conditions up to 130,000 feet, he creates flight and landing trajectory projections and he advises the team about windows for tests and the final launch. To verify these windows, Don and the team release balloons to assess conditions above Roswell, New Mexico, and also receive data on upper-level conditions from balloons launched twice daily at El Paso, Texas, and Albuquerque, New Mexico. Even so, conditions can change unexpectedly only hours before take-off – or during the mission itself. The Mission Control Team will receive meteorological readings throughout the mission and keep Felix informed to ensure a safe flight. Unprotected exposure in this area of the stratosphere for a matter of seconds is only survivable with aggressive medical care. While it isn’t a complete vacuum, the number of breathable air molecules is so few, you cannot survive without creating a human-friendly pressurized climate. Until now no medical treatment had been developed to deal with long term exposure to these hostile elements. The Red Bull Stratos Team has created a treatment protocol in case of an emergency. Felix’s pressurized capsule and space suit are designed to minimize high altitude risks. Felix Baumgartner’s supersonic freefall from the edge of space on October 14, 2012, reached an even faster speed than originally estimated: Mach 1.25. The statistic was just part of the news shared in a report detailing the results of a three-month-long analysis of mission data conducted by the Red Bull Stratos science team, released on 5 February 5, 2013. Baumgartner’s record-breaking maximum vertical speed was revised upwards to 1,357.6 kmh / 843.6 mph / Mach 1.25 from an initial estimate of 1,342.8 kmh/ 833.9 mph/ Mach 1.24. With the help of additional data recorder analysis, the jump altitude was revised slightly down to 38,969.4 m / 127,852.4 ft from the previous estimate of 39,045 m/ 128,100 feet. The Austrian adventurer’s freefall demonstrated that, with the right equipment and proper training, a human being can safely accelerate through the sound barrier. That is a vital breakthrough for the aerospace industry as it looks for answers to the questions of crew and passenger escape in emergency situations, especially with commercial space travel on the horizon. The documentation was finalized after the mission’s science team conducted a private peer review, the Red Bull Stratos Scientific Summit, at the California Science Center on January 23, 2013, where the attendees included NASA astronauts, U.S. Air Force officers, and representatives from commercial aerospace companies such as Virgin Galactic, Northrop Grumman, SpaceX, XCOR, Sierra Nevada Corporation and more. The eagerly awaited released data not only includes Baumgartner’s heart and respiratory rate, but also indicates the forces he encountered at milestones throughout the mission. Baumgartner’s heartbeat reached a maximum of 185 beats per minute (bpm) when he exited the capsule and ranged from 155 to 175 bpm during freefall. Baumgartner, whose heartbeat during the pre-launch oxygen pre-breathe period was 40 to 100 bpm, had a heartbeat of 60 to 100 bpm during the ascent and 169 bpm when he hit Mach. 1.25 on the way back to earth, 155 to 180 during the parachute descent, 163 upon landing and 100 as the recovery helicopter flew him back to Mission Control. His respiratory rate hit a maximum of 30 to 43 breaths per minute during the freefall. The mission achieved many science innovation milestones such as: the development and validation of pressure suit and personal parachute rig innovations; the development of new medical treatment protocols, including a protocol for the condition of ebullism anticipated to become the new standard of care; and the introduction of a “reefed” parachute system to the task of high-altitude payload recovery, offering potential benefits for both passengers and cargo. Baumgartner’s space suit was custom designed to provide the mobility necessary for controlled freefall, as well as modifications to enhance visual acuity, GPS tracking and thermal protection. “He could have gone to the moon in that suit, but yet he was also able to fall in a head-down position and be comfortable inside it,” said Mike Todd, the life support engineer from Sage Cheshire Aerospace who personally dressed Baumgartner for every jump. Also new was the introduction of a “reefed” parachute system. Typically with high-altitude payloads, a recovery parachute deploys fully as soon as the payload releases from the balloon. The Red Bull Stratos capsule parachute, however, was “reefed”; meaning that restraining fabric around its circumference held the opening to just under 5 m /17 ft in diameter for the initial part of the descent, allowing the capsule to fall quickly (up to nearly 560 kmh / 350 mph) before full parachute deployment. The result was a one-third reduction in drifting (resulting in better accuracy in landing zone prediction) and an estimated two-thirds reduction of descent time. Don Day, the mission’s meteorologist, stated, “The Red Bull Stratos program will set a new standard in stratospheric lighter-than-air flights and payload. Utley pointed out that Baumgartner’s jump altitude was a “quantum” 24-percent higher than the previously known highest exit altitude, Joe Kittinger’s 1960 jump from 31,333 meters / 102,800 feet. He also reconfirmed Baumgartner’s originally stated freefall time: 4 minutes, 20 seconds, and noted that Baumgartner’s balloon reached a peak altitude of 39,068.5 meters / 128,177.5 feet, the highest manned ascent known, before descending slightly as the Austrian prepared to jump. The Red Bull Stratos team continues to analyze deeper layers of data, with results to be shared in venues such as journal publications and conferences. But the true legacy of the mission will become apparent as new projects and programs take inspiration from the information provided by Baumgartner’s mission to make pioneering efforts of their own. SPACE-RATED CAMERAS WILL CAPTURE EVERY ANGLE OF THE RED BULL STRATOS MISSION. THE CHALLENGES OF PROVIDING EXTENSIVE STILL – VIDEO IMAGES IN THE EXTREMES OF THE STRATOSPHERE HAVE PROVEN AS COMPLEX AS EVERY OTHER MISSION COMPONENT. All camera systems being used for the Red Bull Stratos mission have been personally designed and developed by the mission’s director of high-altitude photography, Jay Nemeth of FlightLine Films. One of only a handful of “zero-G” qualified cameramen, Jay Nemeth has logged zero-gravity flights for various projects, including a shoot with Apollo 11 astronaut Buzz Aldrin. In addition to being comfortable in zero-G and high-G environments, he is familiar with the specific camera systems that work well in these conditions. FlightLine Films offers long-range optical tracking, zero-gravity qualified crews and HD cameras for use in the cold vacuum of space, as well as housings that allow traditional motion picture cameras to operate in that hostile environment. Camera and communications systems are essential to establish visual contact with Felix Baumgartner, to document the mission’s progress in real time and for future review, and to broadcast the images to a global audience. The Red Bull Stratos camera system configuration is unique. Most cameras required modification or special electrical and thermal systems to function in near space. Cameras have trouble working in extreme cold and extreme heat, as well as in a near vacuum. All cameras have been tested in a special chamber that simulates the conditions of high altitude and space. Where necessary, cameras have been placed in custom pressurized housings designed and built by FlightLine Films and Micar Fabrication & Design Company. When filled with nitrogen gas, the housings simulate the environment on Earth. Four of the capsule cameras are space-rated units attached to the exterior base, eight are in the pressurized housings also on the exterior, and three are interior. All will be remotely controlled from the Mission Control Center. The capsule’s nine advanced HD cameras each individually record to solid-state RAM (random-access memory) recorders, and each is also routed to one of three digital video transmitters for live viewing on Earth. Special filters are used on some of the Red Bull Stratos cameras because the brightness of the sun is more intense in the upper stratosphere. It is anticipated that some of the cameras inside the Red Bull Stratos capsule will be covered in ice upon touchdown. The suit cameras must function in near-space conditions for up to 20 minutes, as well as at supersonic speed and in any orientation (upside-down, sideways, etc.). The Red Bull Stratos capsule and Felix Baumgartner’s pressure suit have more HD cameras than most 45-foot television production trucks. A typical satellite uplink truck has one or two channels of microwave video. The Red Bull Stratos capsule has three. To achieve a live broadcast from 24 miles above the Earth, an optical ground tracking camera system was developed with features ranging from infrared to high-definition cameras. This system is called the “Joint Long-range Aerospace Imaging and Relay”: JLAIR. Two JLAIR units are used for the Red Bull Stratos project. It carries a variety of high-power zoom lenses and large telescopes attached to an 8,000-pound motorized pedestal, previously used to track Space Shuttle launches. The control room allows technicians to select the best images available and transmit them in real time to Mission Control and/or broadcast viewers. JLAIR 1 is the first fully integrated tracking system on one vehicle chassis that includes an optics payload of over 1,000 pounds, an air-conditioned control room, an on-board generator for the tracker and sub-systems, and encoding and satellite transmission of HD video. JLAIR 2 shares the same features but employs a traditional trailer-mounted pedestal with separate control truck for mission flexibility. All of the above camera systems being used for the Red Bull Stratos mission have been personally designed, developed and tested by the mission’s director of aerospace photography, Jay Nemeth. Jay has worked as an aerial cinematographer for over 25 years and is one of only a handful of “zero-G” qualified cameramen with full-pressure suit experience. His company, FlightLine Films, provides leading-edge astro cinematography services, offering both advanced technology and outstanding aesthetic results. Since 1984, Las Vegas-based FlightLine Films has been providing aviation customers and motion picture producers with the highest quality in aerospace cinematography services. The company has pioneered visual documentation systems for the private and commercial space programs advancing into the 21st century. FlightLine offers zero-gravity qualified crews and HD cameras for use in the cold vacuum of space, as well as housings that allow traditional motion picture cameras to operate in that hostile environment. In the air during much of Felix Baumgartner’s mission will be a tracking helicopter equipped with a Cineflex camera that is stabilized with a gyro system for precision optics to a sub-pixel level. The helicopter’s system allows tracking of both Felix and the capsule, with display of the resulting image on a moving map that shows the helicopter’s own relative position. That moving map image can be displayed to Mission Control to increase situational awareness, and it enables this tracking helicopter to guide the recovery helicopter to Felix’s landing site. For Felix’s second stratospheric test jump, the helicopter was assigned to capture HD aerial footage of Felix under his parachute and during landing to transmit live via microwave to Mission Control; as well as to track the capsule and capture the first aerial shots of the vessel descending under its cargo parachute, enabling assessment of how the capsule sustains landing in potentially rough terrain. With additional seating capacity, the helicopter typically also carries a still photographer to capture even more images for the mission. The Red Bull Stratos tracking helicopter is provided by Airborne Images and manned by aerial director Carston Belland pilot Aaron Fitzgerald, who is the company’s founder, president and CEO. Together, the two have more than 30 years of experience in film and television aviation. A former U.S. Army paratrooper in the 82nd Airborne Division with a passion for both flying and photography, Aaron possesses flying experience encompassing motor racing support, external load and offshore support. He also serves as a demonstration pilot, including performances with the Red Bull Air Force demonstration team. Airborne Images is a full-service aerial production company that has provided service to Red Bull Stratos that began during pressure suit and parachute system development and continues through test and training jumps to the final mission. In addition, the Los Angeles-based company serves the motion picture industry worldwide with helicopters, airplanes, pilots, gyro-stabilized camera systems, aerial directors of photography, stunt coordinators and a comprehensive range of additional aerial production resources. The entire communications solution for Red Bull Stratos is provided by industry leader Riedel Communications. Communications and Video/data transmission and distribution. Riedel provides the communications infrastructure on-site. This includes the entire compound: Mission Control, the production offices, the Media/Press Center and the outside broadcasting (OB) truck are integrated into one single communications infrastructure via a Riedel Artist Digital Matrix system. Artist is a fiber-based communications solution that offers highly flexible, reliable decentralized and communications in broadcast-quality audio. Furthermore, the on-site digital radio network (MOTOTRBO), with its 100 devices and ten channels, is not only provided by Riedel but also seamlessly integrated into the wired matrix intercom system. This means radios can directly talk to users (e.g., in the Mission Control center or the production office) and vice versa. All video signals on the ground are distributed and routed with Riedel’s MediorNet technology. MediorNet is a fiber-based real-time network for HD video, audio, communications and data signals that also provides integrated processing, for extraordinarily efficient installation and maintenance. The Red Bull Stratos mission uses 24 MediorNet nodes that are installed in a redundant ring topology to provide maximum reliability. In case a connection between two nodes gets lost, the signals will still be distributed due to the redundant topology. The connection to the flightline where the balloon and capsule are launched is also realized with the MediorNet system – in this case with two MediorNet Compact frames that are connected to the main system. All links in the MediorNet system are realized with Riedel PURE, an extremely robust, mobile fiber cable that is equipped with rugged Neutrik OpticalCON Quad connectors. MediorNet transports all video signals of the mission, as well as all signals from the OB truck and all signals from the JLAIR tracking truck. It also distributes the broadcast audio between Mission Control and recording. Furthermore, the data of the telemetry used for other broadcast applications is transported via MediorNet. In addition to the video transport, MediorNet also serves as a network backbone for the on-site Internet connection, providing Ethernet connectivity in all areas of the compound. Similar to the setup on the ground, Riedel is responsible for the capsule communications system as well as for the video transmission solutions. A specially developed communications system provides reliable communication between Felix Baumgartner and Mission Control from pre-launch through the entire ascent. A unique telemetry control was specially developed for the capsule’s nine HD video cameras. This system enables control of the video recording and works as a comprehensive digital video router – not unlike having a mini OB truck inside the capsule. It offers complete remote control of the whole video system and features three video downlinks that can be dynamically assigned to the selected cameras. 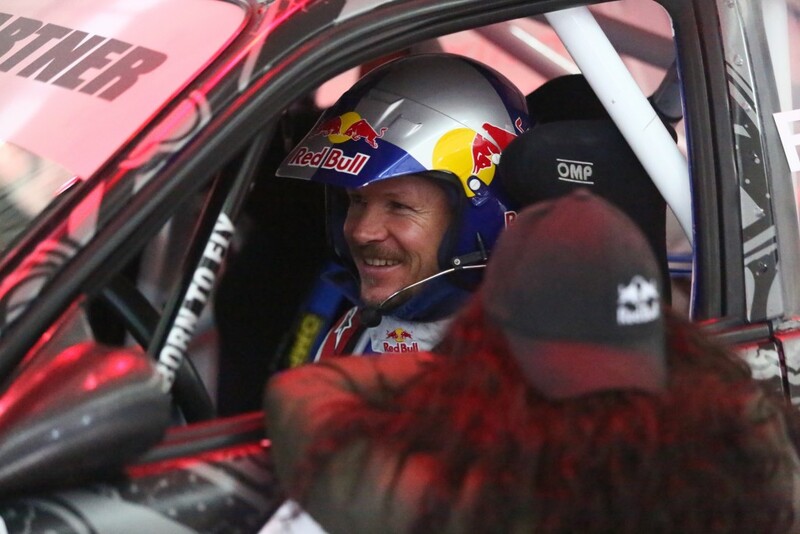 Riedel’s solutions for Red Bull Stratos communications have been three years in development. A total of 5 km / 3.1 miles of fiber cabling are used for the Red Bull Stratos communications solution. Riedel Communications – renowned for its pioneering advanced fiber, intercom and radio technology – provides the entire communications solution for this outstanding project, integrating both wireless and wired digital intercom systems. Additionally, Riedel furnishes the fiber-based video and signal distribution as well as the wireless video links to the capsule’s onboard cameras – enabling stunning pictures to be delivered from the Red Bull Stratos capsule. Eight Riedel team members contribute to the mission firsthand at the launch site in Roswell, New Mexico, led by Matthias Leister, head of broadcast solutions, and Jacqueline Voss, system engineer. A 40 ACRE DRY CLEANER BAG CARRIES NEARLY 3,000 POUNDS. THAT’S THE RED BULL STRATOS BALLOON. Type: The balloon is filled with helium to create lift. Helium is non-flammable, non-toxic if vented to the atmosphere and a safe, predictable method of ascent. Material: It is constructed of strips of high-performance polyethylene (plastic) film that is only 0.0008 inches thick. In total, these strips would cover 40 acres if they were laid flat. Polyester-fibre reinforced load tapes are incorporated to do the weight bearing. Size, volume and shape: The balloon for Felix’s mission from the edge of space will be nearly 30 million cubic feet in capacity – 10 times larger than Joe Kittinger’s balloon in 1960. Helium is delivered on two large trucks. Another truck with a “launch arm” restraint holds down a portion of the balloon during inflation. At launch, the arm moves out of the way to allow the balloon to ascend. Simultaneously, a large crane drives in to position the capsule under the balloon. The crane releases the capsule, the balloon lifts it off the crane, and the ascent begins. Was the balloon specially developed for the Red Bull Stratos mission? The balloon is a standard design utilizing principles and materials that have been refined over 60 years of high-altitude scientific balloon flights. Are there hazards associated with helium balloon flight? Balloons are susceptible to wind, which can literally tear them – particularly at critical times. Take-off, when difficulties due to weather or other factors could drag the capsule across the ground or cause a sudden dangerous drop in height. If a problem occurred below 1,000 feet, there would not be enough time to deploy a personal or capsule parachute. Ascent through the troposphere (30,000 to 60,000 feet), where turbulence is common. Float altitude(top altitude), where low air pressure will cause the helium to expand so much that if the excess cannot escape through the balloon’s vent tubes, it will burst. Helium inflation quantities are carefully calculated to avoid this. How long does it take to inflate the balloon? The overall launch process for this kind of balloon requires approximately 8 hours of preparation immediately before launch, including about 45 to 60 minutes for insertion of the helium. How big is the launch crew? The balloon launch crew itself is about 12 to 15 people, all of whom must wear clothing that won’t snag the balloon. A number of individuals will clear the runway of fine debris before laying out the balloon. Fewer than 10 people actually handle the balloon, and those who do wear cotton gloves. Why does a helium balloon rise? Helium is lighter than air. If the balloon is large enough in relation to the weight of its payload, the helium will ascend and bring the payload with it. How fast will the balloon ascend? The balloon will ascend at about 1,000 feet per minute. At some points, its ascent could be as fast as 1,400 feet per minute. Upon reaching about 100,000 feet, however, it will likely slow to roughly 750 feet per minute until it levels off at approximately 120,000 feet above sea level. Wind is used to direct a balloon’s trajectory. Wind speed and direction vary at different altitudes so balloons are steered by changing altitude to reach the desired wind conditions. Releasing helium causes a decrease in altitude, while dropping ballast allows a balloon to rise. How does the balloon avoid other aircraft in the sky? The balloon will be tracked by the mission team while in the air. The mission team coordinates closely with the U.S. Federal Aviation Administration to obtain clearance for flight and special reflective tape is incorporated into the seams so that it can be seen on radar. Felix’s target altitude is described as “float altitude.” What is that? Float altitude is the point at which the balloon levels off and stops ascending. Although helium is lighter than air, at higher altitudes air density is reduced. Float altitude is reached when the average density of the balloon is the same as the density of the surrounding atmosphere. What happens to the balloon after Felix jumps? After Felix has landed, Mission Control will trigger the separation of the capsule and balloon, so that the capsule can descend under its parachute. A nylon “destruct line” will release the helium so that the balloon returns to Earth. Then, the team will gather the envelope into a large truck, a process that can take several hours. Is the same balloon being used repeatedly for tests, as well as the final mission? No. The test balloons are smaller than the almost 30 million cubic foot balloon used for the ascent to 120,000 feet. None of these delicate balloons can be re-used. In fact, once Felix’s balloon is even taken out of its box it must be launched promptly or discarded. Who is responsible for launching the balloon? The best weather conditions for balloon launch usually occur at dawn. Here is an approximate timeline. Launch minus 8 hours After a weather and safety briefing, the team inspects the equipment and communications systems, then pulls the boxed balloon and equipment out of the hangar while a separate crew works to clear the runway of dirt, debris and other objects. The capsule and balloon are delivered to the launch area on a cleared runway. More checks and re-verifications are conducted. Crew Chief contacts Mission Control for permission to lay out the flight train components. Balloon is laid out on a layer of Herculite. Then balloon, parachute and capsule are connected. Layout of flight train is complete. Launch minus 2:15 hours Balloon’s helium valves are rechecked and verified. Launch minus 1:15 hours All capsule checks are complete. Crew chief contacts meteorologist and requests permission to begin inflation. Felix is sealed in capsule which is cradled on a crane and pressurization begins. Crew chief inspects the entire flight train and removes all safety restraints. Launch minus 0:01 hours Balloon bubble is released from launch arm. As the balloon rises, the crane bearing the capsule drives rapidly down the runway to meet it. The crane releases the capsule when it’s vertical with the balloon. The balloon lifts the capsule off the crane and the ascent begins. HE CAPSULE OPERATES AS FELIX’S CONTROLLED CLIMATE ALL THE WAY TO 120,000 FEET. THE CAPSULE PROTECTS FELIX BAUMGARTNER FROM SUBZERO TEMPERATURES IN A PRESSURIZED ENVIRONMENT WITH OXYGEN. Aviation pioneer Felix Baumgartner and the Red Bull Stratos team have been preparing for years to break the record for highest-altitude jump, eclipsing a mark set more than 52 years ago by Col. Joe Kittinger. The capsule, which at about 1.315 kilograms/2900 pounds weighs a little bit more than a VW Beetle, was damaged in a hard landing following Baumgartner’s 2nd test jump from a near-record altitude of 97,145 ft / 29,610 meters in July 2012. On September 24, 2012 the repaired capsule underwent testing in an altitude chamber at Brooks City-Base in San Antonio, Texas. The capsule was exposed to the extreme conditions it will face in the unforgiving environs of the stratosphere. After passing all the tests, the capsule was sent back to Roswell. Since the final manned flight Oct. 14, 2012, the capsule is recognized as a technological marvel safely delivering Felix to 128,100 feet (39,045 meters). A central goal of the Red Bull Stratos project is to collect valuable data for science that could ultimately improve the safety of space travel and enable high-altitude escapes from spacecraft. The pressure sphere contains the capsule instrumentation and it’s where Felix is positioned throughout the ascent. · The sphere will be pressurized to 8 pounds per square inch (psi), the equivalent to 16,000 feet above sea level, which will significantly reduce the risk of decompression sickness during the ascent without requiring Felix to inflate his pressure suit. · The cage frame is the point where the capsule attaches to the balloon and it will also bear the load for the parachute system and capsule touchdown. The shell surrounds the pressure sphere and cage and is the part of the capsule that is visible to the observer. The 8-foot-diameter capsule base is the broadest part of the vessel, providing protection in the form of the base panel and crush pads. · Engineers performed more than 150 drop tests to develop the crush pads. After Felix Baumgartner safely jumped and the Mission Control team determined that the balloon and capsule were over a suitable open area, Mission Control remotely triggered the release of the capsule from the balloon. The capsule parachute, which had been incorporated in the ‘flight train’ between the capsule and the balloon, immediately deployed. ‘Reefing’ (restraining) fabric around the circumference of the parachute held it to 17 feet / 5 meters in diameter for the initial part of the descent, allowing it to fall quickly (about 2,000 feet / 610 meters per minute). At an altitude of 20,000 feet 6.096 meters, the reefing was automatically released by a barometric sensor, allowing the canopy to expand to its full 100 feet / 30 meters in diameter so that the capsule would descend more slowly (estimated about 6 meters per second) with a minimum of swaying. Its descent took about 24 minutes. The capsule’s landing in a flat, open area just over 55 miles / 88 kilometers due east from the launch site was gentle – under 3 Gs – so soft that the impact displaced only about 30 percent of the crush pad material incorporated to absorb the force. The capsule softly rolled onto its back, with Baumgartner’s door facing the sky. According to design, as the capsule fell away from the balloon in the stratosphere, a cable tore a ‘gore’ (panel) from the balloon, releasing its (nontoxic) helium. The empty plastic envelope fell to earth, passing the capsule and landing about 15 minutes later about 7 miles / 11 kilometers west of the capsule. A crew of twelve personnel were waiting to recover the equipment. Together they formed a convoy of five trucks and an all-terrain vehicle. Thanks to the flight path predictions of meteorologist Don Day, visual tracking via ground-based optical systems, and GPS trackers, the team was within 300 yards of the capsule when it landed. On arriving at the capsule, the team first shut off the liquid oxygen and liquid nitrogen systems. Wells took photos of the ‘switchology’ – the switch configuration of Baumgartner’s instrumentation and the oxygen and nitrogen quantities and pressure, to document the exact configuration at landing. Next, the crew shut down the capsule’s system of 15 cameras and retrieved the camera data. Then the crew from Sage Cheshire Aerospace, which built the capsule, completed the final step by shutting down the rest of the systems and overall capsule power. Next up was balloon retrieval. The crew drove the 7 miles / 11 kilometers to the balloon and managed to wrangle the unwieldy 40 acres of material weighing 3,708 pounds / 1682 kilograms into a large open truck within about 45 minutes. Mission accomplished, the capsule and balloon crews arrived back at the Roswell launch site with the equipment at about 5:00 pm local time, seven and a half hours after Baumgartner’s takeoff, and about 21 hours after most of the crew had arrived at the airfield to begin launch preparations the night before. The capsule and the balloon envelope are being returned via ground to the mission’s technical hub at Sage Cheshire Aerospace in Lancaster, California. While some of the camera data was downloaded immediately in Roswell, more will be extracted at FlightLine Films in Las Vegas, Nevada. Temperature, pressure, and other data from the capsule recorders will be analyzed for months to come, and the information will be shared with the science community. The vessel itself will be saved for posterity. WITH IMPROVEMENTS LIKE MOBILITY AND PERSONALIZED ADJUSTMENTS, THIS FULL-PRESSURE SUIT MAY SERVE AS THE PROTOTYPE FOR THE NEXT GENERATION OF EXPLORERS. Felix Baumgartner’s full-pressure suit and helmet are his personal life support system. Once Felix jumps, this system will be his only protection until he reaches the safety of the lower atmosphere. Full-pressure space suits have never been qualified for the kind of controlled freefall that Felix must execute to return safely to earth. Proof that a full-pressure suit could provide protection from such a bailout will be valuable for aerospace safety researchers. The suit is designed to provide protection from temperatures of +100°F to -90°F. When pressurized to 3.5 pounds per square inch (roughly equivalent to the atmospheric pressure at 35,000 feet), the suit can help to avert symptoms of decompression sickness (the “bends”). Above about 62,000 feet, the liquid in Felix’s tissues could turn to gas and expand dangerously, a condition called ebullism, but the suit will maintain pressure around his body to prevent such expansion. Felix’s suit was modeled on suits worn by pilots of high-altitude reconnaissance aircraft. However it has been custom made to his measurements and modified with new enhancements. Skydivers need to be able to use body positions and visual cues, but an inflated pressure suit and its helmet limit range of motion and peripheral vision. With modifications, including mirrors and added mobility, the Red Bull Stratos suit may serve as the prototype for the next-generation full-pressure suit. The exterior of the suit is made of a material that is both fire retardant and an insulator against extreme cold. A “controller” is the “brain” of the suit. Only the size of a hockey puck, it’s an extremely reliable mechanism for maintaining pressure automatically at various altitudes. A vent hose fitting will keep the suit ventilated with warm or cool air in the capsule.During the long ascent, warm air will help to keep Felix from becoming dangerously “cold soaked,” while cool air can help to avert perspiration that can fog the visor. The suit attaches to the helmet with a rotating, locking neck ring, and the gloves use a similar rotating and locking device. These types of rings operate with ease under pressurized conditions. The helmet shell is molded from composite materials, which help to keep its weight low (about 8 pounds), yet are strong and resistant to impact. The visor is distortion free in the critical vision area because visual cues are important both in the capsule and for orientation during descent and landing. The helmet’s oxygen regulator will provide Felix with 100 percent oxygen to breathe from various sources (a liquefied oxygen source on the ground before launch, from the capsule’s liquefied system when he’s onboard, and from a pair of high-pressure gaseous oxygen cylinders during the freefall descent). An independently operated sunshade is fitted over the visor so that Felix can adjust it to his needs. The visor has an integrated heating circuit to prevent fogging and icing. A number of redundant (backup) systems are incorporated into the helmet/visor. For example, the visor is equipped with a mechanism that requires two separate coordinated actions to unlock; this safeguard is designed to prevent accidental opening that would depressurize the suit. The helmet isequipped with a microphone and earphones for contact with Mission Control. The helmet drinking port will enable Felix to stay hydrated yet maintains a tight seal. How many pressure suits have been made for the Red Bull Stratos mission? One prototype and two production suits. Who made the Red Bull Stratos full-pressure suit? David Clark Company produced the suit. David Clark Company has pioneered air and space crew protective equipment design, development, test, evaluation and production since 1941, with products ranging from anti-G suits to space suits and ancillary equipment. Additional information can be found at www.davidclark.com. Who else is involved in fitting, testing and producing the Red Bull Stratos full-pressure suit? Red Bull Stratos team members involved with the capsule, parachutes, cameras and communications collaborate closely to make sure that their systems interface optimally with the suit. Taking the lead in coordinating them is the Red Bull Stratos life support engineer, Mike Todd. For almost 30 years, Mike worked in the High Altitude Life Support and Pressure Suit Division of Lockheed’s “Skunk Works,” and he also fitted pressure suits for Steve Fossett’s record-breaking Perlan glider project. Riedel Communications provides the flight communications radios that Felix wears, as well as those in the capsule. FELIX’S PARACHUTE SYSTEM INCLUDES REVOLUTIONARY SAFETY TECHNOLOGY. THIS ONE-OF-A-KIND RIG HAS KEY FEATURES YOU WON’T FIND IN ANY OTHER PARACHUTE SYSTEM. Prior to this mission, no personal parachute system had ever been used for a supersonic freefall from the edge of space. Years of development and testing resulted in revolutionary drogue technology, which would have stabilized Felix Baumgartner had it been necessary during his freefall. The container houses the drogue stabilization chute and the two landing parachutes (main and reserve), while the harness attaches the entire rig to Felix Baumgartner and holds two oxygen bottles, which can supply at least 10 minutes of oxygen at altitude. The drogue stabilization chute and G meter offer breakthrough skydiving technology. This is the first personal drogue equipment ever designed for supersonic deployment, and it’s the first ever designed to function completely independently of the main and reserve parachutes. If Felix had become unstable, he would have used the drogue chute to keep from spinning uncontrollably. A G-meter would have opened the drogue stabilization chute automatically if Felix experienced 3.5 Gs or more for a continuous period of 6 seconds. A drogue deployment button was strategically placed in Felix’s glove. Holding down this button for three seconds would have fired the drogue stabilization chute. The main parachute is the only parachute in his rig that was deployed. This nine-cell, ram-air, 270-square-foot/25-square-meter canopy does not open automatically. Felix pulls the handle to deploy it at 5,000 feet/1,524 meters. Felix’s main and reserve (emergency) parachutes are rated to be opened at 150 knots, which means he had to slow to about 172 mph / 277km/h for safe deployment. Felix could have deployed his reserve parachute manually, but the system included CYPRES (Cybernetic Parachute Release System) technology to deploy the reserve automatically if exceeding a vertical speed of 35 meters (115 feet) per second at a predetermined altitude (around 2,000 feet / 610 meters). The combined parachute system components – Felix’s overall rig – weigh about 60 lbs./27 kg. In comparison, a typical skydiving rig weighs about 20 lbs./9 kg., and a BASE jumping rig weighs 10 to 12 lbs./4 to 5 kg. Packing the reserve parachute takes about an hour, while packing the main parachute and drogue stabilization chute requires about 20 minutes each. Normal skydiving rigs don’t have a mechanism to cut away the reserve parachute, a skydiver’s last resource in an emergency. If Felix’s reserve chute inadvertently deployed at high altitude, his landing would have been delayed so much that he’d run out of oxygen. In that unlikely situation, Felix would have used a handle to cut away the reserve parachute and return to freefall, finally pulling his main parachute once he reaching a “normal” altitude. Up until this point, no parachute was guaranteed for jumps higher than 25,000 feet/7,620 meters. Felix jumped from approximately 128,100 feet and everything worked as planned. Drogues are typically attached from the middle of the skydiver’s back, but Felix’s drogue stabilization chute hangs from his shoulders to help reduce the potential for dangerous spinning. The initial concept for the Red Bull Stratos personal parachute system was developed and design process spearheaded by skydiving consultant Luke Aikins, in collaboration with Felix and the mission’s science team including expert consultants from Sage Cheshire Aerospace. Luke took his ideas to Kelly Farrington, founder of Velocity Sports Equipment. Kelly refined Luke’s design and worked with the Red Bull Stratos team to fine-tune and manufacture the harness and container system and drogue. Meanwhile, Precision Aerodynamics supplied the main parachute and reserve parachute. The CYPRES automatic release system was provided by AIRTEC and the altimeter by Larsen and Brusgaard. A serious investment into research and development, combined with high-quality practices, has made AIRTEC the technological leader in the field of Automatic Activation Devices. AIRTEC’s innovative expertise and precise manufacturing has produced CYPRES (Cybernetic Parachute Release System), a technology that affords the Red Bull Stratos team the highest levels of safety and reliability to achieve its goals. Larsen and Brusgaard is the preferred supplier of visual wrist mounted altimeters for the Red Bull Stratos project. The cutting edge technology and design used in L&B’s altimeter, Altitrack, allows for secure use in harsh environments and trying conditions and the continuous R&D gives the Red Bull Stratos team the latest in altitude awareness. L&B is proud to support this mission with Altitracks for pilot Felix Baumgartner and skydiving consultant Luke Aikins. CYPRES 2 AUTOMATICALLY INITIATES THE RESERVE PARACHUTE AT A PREDETERMINED ALTITUDE. No bigger than a lunch pail. Felix’s chest pack houses monitoring, tracking and communication systems. This chest pack was designed with Felix’s comfort and balance in mind. It’s not too heavy or cumbersome to wear over his pressurized suit while still maintaing a streamlined shape. Think of it as a mail box in terms of size and purpose. All the data recorded inside the chest pack will report Felix’s speed, position, and altitude back to Mission Control. The voice transmitter and receiver that connect to his helmet. GPS beacons to track his position. Telemetry equipment (which enables data capture and monitoring from long distances). An HD camera with a 120-degree view that encompasses Felix’s faceplate as well as the ground below when Felix is in his streamlined, angled “delta” position. A package that will be used by the world governing body for air sports and aeronautical world records (the Fédération Aéronautique Internationale) to verify the records Felix hopes to establish. An inertia measurement unit (IMU) that will report altitude (pitch/angle) and spin.